Unsure of what flavor to get? No worries, just ask for a sample and they will gladly give you some. I bought the Cajun Caramel and Banana Caramel and brought them home (yes, as carry-on during my flight home). Initially, I thought these flavors were odd, but Miss D knew what she was thinking when she came up with these flavors. They are so delicious. I wish I bought more to bring home. Miss D's also sells homemade, New Orleans-style pralines and other candies. Sadly, I did not get a chance to try them, because I was busy eating the popcorn. So if you're in the area be sure to stop by and try her popcorn. Maybe a new flavor will be available as she's always whipping up something good. Are you looking for an addiction? I've got just the thing for you. Go to the Sweet Auburn Curb Market, walk through the front door and look to your immediate right. You'll see Miss D's New Orleans Pralines. This is not a new merchant. Dionne Gant, who appropriately calls her customers "sweetie," piles her counter mainly with caramel popcorn and I've enjoyed that candy crack before. This time, her crew was busy making candy-apples fat and red enough to de-repress sugary memories of childhood carnival visits. But I wanted a praline. I've never actually tried one before. I haven't even seen one. But after lunch at Ciao Bocca earlier this week, I stopped by and asked where they were. Miss D pointed at the stash behind the counter and I bought two. They're $2 each and let me warn you: they are packaged in a plastic envelope so tough you should open it before you leave. If you try to tear it open while driving, you'll shatter the delicate contents before you even nick the envelope. Carry scissors. The packaging protects what may be the best praline I've ever tasted in our city. They're sweet enough to put even Paula Deen into a diabetic coma, of course. They melt, they slightly burn the back of the throat. They are afloat — and I think this is the best part — with chunks of Georgia pecans that actually taste like pecans. The chunks are few and far between, but you'll be amazed. I live in Grant Park and the temptation to return for a dozen or two is almost unbearable. Damn you, Dionne Gant! There are thousands of stories to come out of Hurricane Katrina. When something bad happens it changes your life forever. Nothing is ever the same. For many who fled the devastation, there was no going home again. Dionne Gant will tell you that she was lost for awhile, scared even. The flood waters had washed away everything: her embroidery and dry cleaning business, her home, her possessions, even her marriage. Who wouldn’t be scared? It wasn’t easy and it didn’t happen overnight, but Atlanta turned out to be more than just an escape. It became a new home, a place to start a new business and opportunity to share her cooking with the public. She’s become just Miss D to most of us—dressed in her signature red chef’s coat. At first she focused on her New Orleans pralines, melt in your mouth creations of sugar, cream, butter and pecans. She made candy apples. But it was when she added popcorn that her business, at the parking lot entrance of Sweet Auburn Curb Market, really took off. Certainly the smell of freshly popping corn was part of the draw, but soon she started adding flavor combinations, including caramel, butter, fruit flavors, bacon, sour cream, cheese…the list tops 200 combinations at this point. And at two containers for $5 they are a bargain you can share. While I can highly recommend the sweets, it’s Miss D herself that is the real treasure. When I’m feeling down, I try to channel her optimism. She is the most positive women I’ve met in a very long time. She makes you feel like you can overcome obstacles too. And it’s not just the sugar rush. Miss D’s New Orleans Pralines is part of the Sweet Auburn Curb Market, Atlanta’s only municipally owned market. You can visit the market on your own or join one of the monthly Atlanta Culinary Tours, where the final stop includes a visit to Miss D’s. Pssst: She usually ends the tour with a free praline, a sample of popcorn, and hug for everyone! Open Monday-Saturday 8am to 6pm. Georgia Made Georgia Grown wrote about the Atlanta Culinary Tour of Sweet Auburn Curb Market. Miss D, in her signature red! Owners of Sisters Vintage Bookshops, Miss D’s and Yum Digggity. Energy and a fresh take on cuisine and trade thrive a few streets away from Georgia State at the oldest public market in Atlanta. Merchants from different backgrounds share a part of themselves with those who enter. Entering the Sweet Auburn Curb Market, all five senses become enveloped in the community formed by more than 20 merchants of specialty items, produce and many others. If the gravitational pull from the smell of burgers, fresh seafood and gourmet popcorn can be put on hold, attention and time can be well spent in one of the market’s specialty shops. Sisters Vintage Bookshops joined the market nearly two years ago and serves as a unique addition. Owned by two sisters, Pam Culbreath and Caroline Walker, the store is home to a magnitude of books including “Road To Tara,” a biography of Margaret Mitchell, to Dr. Phil self-help books just steps away. Culbreath feels that this bookstore has a deeper meaning to the market and its customers. They use their love of books to counsel and make a mark in the community. Not only does the bookstore carry a large quantity of books for the public but it also provides benefits to college students. The owners are aware of its proximity to Georgia State and will search for the best deal on textbooks and order them for students. The appreciation for students is echoed throughout the market. Jonathan Young is a partner in Yum Diggity along with his brother Carson Young and Ed Hanger. Yum Diggity specializes in its meat quality, using no fillers and ordering their meat from a local meat factory called Wienerz. They offer a special to students called a Diggity Combo for $5.95. Although this restaurant has only been in the market about two weeks, they know what makes them unique and love the fact that they can provide a big meal for an affordable price. Around the corner and in front of another entrance to the market lies a fiery and passionate cook at Miss D’s New Orleans Style Candy. Miss D, Dionne Gant, hands gourmet popcorn, candy apples and other sweets including her notorious pralines over the counter to numerous customers everyday. Gant, who has been cooking since the age of seven, emphasizes her use of a special ingredient in all of her treats. “Much love,” Gant said. “I just want to know it’s made from the heart.” Gant is a native from New Orleans and found her way to Atlanta after Hurricane Katrina. She always had a love for cooking and felt that she could bring her love to the market. “That was my way of coming up with a way to give back for all that they gave to the people of New Orleans,” Gant said. Her contribution has not gone unnoticed by the many loyal customers that make daily and weekly visits to Miss D’s place in the market. Julian Rosemond Jr., a worker in the human resources department at Grady hospital, visits Miss D’s stand three to four times a week. “Miss D’s is the best place in here,” Rosemond said. After tasting her blueberry caramel popcorn or an authentic New Orleans praline using Georgia pecans, it is hard to argue with her loyal customers. Along with regulars like Rosemond, many students enjoy lunch in the market. Speech major Carissa Fair has only visited the market twice and loves the variety that it offers. Another Georgia State student and sculpture major James Vincent visits the market frequently because of its proximity to the sculpture building across the street on Auburn Avenue. “I come here all the time,” Vincent said. Sweet Auburn Curb Market is currently being renovated. This is not only bringing in new merchants like Yum Diggity but also new customers. Afro Dish Authentic African Caribbean Cuisine mixes the old with the new. This restaurant is a family owned and run business by a family originally from Ghana. Vincencia Sarpong, an owner with her husband, has been a part of the market family since 1997. Sarpong smiled and greeted customers from behind the counter while customers glanced at a picture of her and former President Bill Clinton. Sarpong met Clinton during a town hall meeting at the market in 1999. She enjoys the diverse clientle and the diversity among the market merchants. Ms. D has been selling pralines for five years. Her first restaurant is right here at the Sweet Auburn Curb Market. Ms. D's journey wasn't an easy one. After the hurricane had come and swept up her entire life, she and her family were relocated to Mississippi, Alabama, and then finally to Atlanta. Kate Krader (@kkrader on Twitter) is Food & Wine's restaurant editor. When she tells us where to find our culinary heart's desire, we listen up. Mardi Gras: those two words might make you think "No way!" Or it might make you scream, "No limits!" If you fall somewhere in the middle - if you want to drink some Hurricanes or Abitas, and wear some beads but keep your shirt on - and can’t make it to New Orleans for the parades, here are a few places around the country that might almost make you feel that you’re there. And hopefully not worry about finding a clean bathroom. At his 30-year-old-restaurant in Chicago, which now has three locations, Jimmy Bannos Sr. turns out remarkable Cajun food; training with legendary New Orleans chefs Emeril Lagasse and Paul Prudhomme will do that for your cooking. Bannos’s cookbook, "Heaven on Seven: Where It’s Mardi Gras All the Time!" makes you think it’s going to get a little crazy on Fat Tuesday. Especially when you see the cover photo of Bannos with more beads than I would have thought humanly possible. Basically every New Orleans-style dish you could want, the Gumbo Pot has got. The huge menu has a New Orleans Favorites section with classics like jambalaya, red beans & rice, 13 different po' boys as well as muffulettas; there’s also meatloaf and frog legs and traditional or chocolate beignets, served with chicory coffee. There’s a brand new location on Hollywood but the annual Mardi Gras party with zydeco music and parades takes place at the Farmer's Market at 3rd & Fairfax. David Guas is an New Orleans native and at Bayou Bakery, he takes his heritage seriously. On Mardi Gras Eve, he’s hosting a dinner with a jazz quartet playing (dancing!). “Beads and cups are yours to keep, costumes optional, and a Bourbon Street attitude necessary,” says the website. Fat Tuesday will feature parade-route fare including: crawfish etouffée, crab boil peppa weenies, Bayou Bakery’s outstanding cream cheese-stuffed King Cakes and cups of Rebirth Punch. This new spot in Queens checks off the greatest hits of Louisiana from boudin balls to muffuletta, served whole or "nice half." 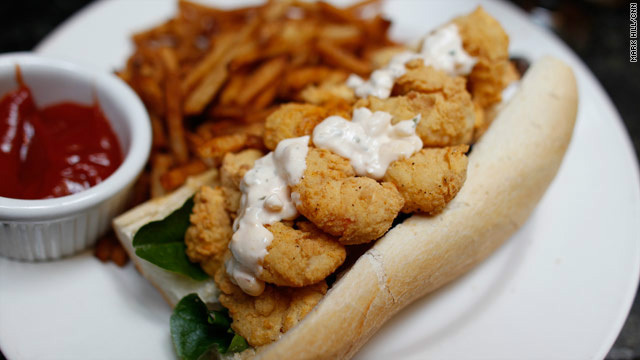 Around this time of year, you’ll see specials like any po' boy plus any Abita beer. They serve the Purple Haze, Turbo Dog, Amber, IPA or the root beer, which is terrific, for $15. If you’re in Atlanta and wanting to celebrate Mardi Gras with some pralines rather than a parade cup filled with Southern Comfort, then you should go to Sweet Auburn Curb Market. Miss D uses an authentic New Orleans recipe and Georgia pecans to make her terrific candies. She also has some amazing, New Orleans-inspired popcorns, like Cajun Fried Pickle, Banana Caramel and Jalapeno.